All artwork was created by Sarah Newton as hand-carved woodblocks and transformed into polymer plates. The map was screenprinted at the Graphic Arts Workshop with the assistance of Annie Axtell. The book takes inspiration from “That’s It: the Center of the Mile,” an intriguingly named liquor store on San Francisco’s Mission Street. It is an observation of the square mile that surrounds this self-proclaimed nexus. The locations found at the edges of the mile, one half mile to the north and the south, in the morning and at night, lead the reader through a mile of urban experience. Sarah Newton received her BFA in Printmaking from the California College of Arts where she studied under Charlie Gill, Barron Storey, and Larry McClary. 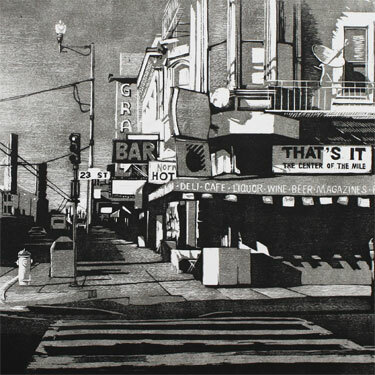 After completing her degree she continued printmaking at the Graphics Arts Workshop in San Francisco. She continues to investigate public spaces, both urban and rural, and the ways in which they are re-contextualized by the activities of the people who use them. Sarah was a featured artist at the SFCB 2010 Roadworks event and her work was included in the Dec. 2010/Jan 2011 west coast issue of New American Paintings.